This photo was taken during a hike in the Badlands, SD. Once you read WHO IS SHAL TO THINK SHE CAN DO THIS, you’ll understand why being strong, fit and healthy is so important and necessary for me. 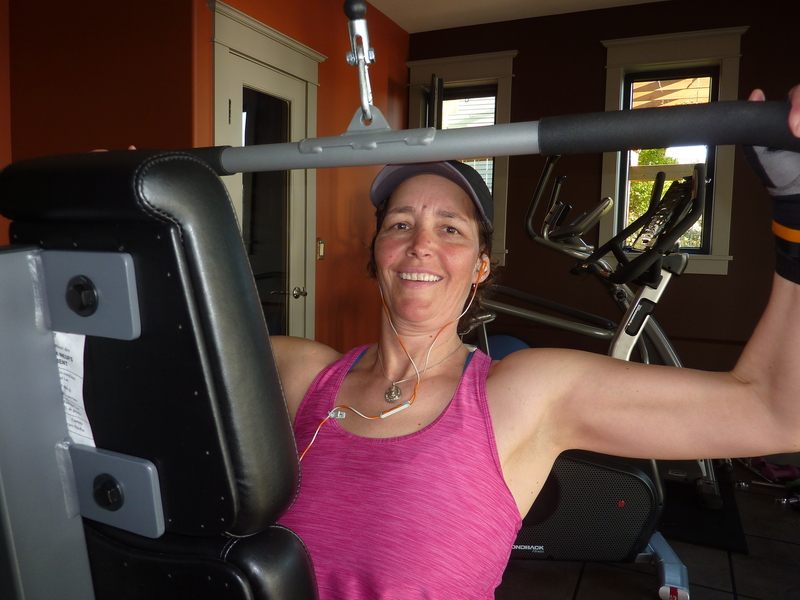 Leading up to our departure for Alaska in June 2014 I continued to workout and focus on my fitness. The five-month trip was demanding and extremely challenging at times. My body hurt most of the time. We wanted to explore off the bikes as well and hiked as much as we could and again it was so challenging. I couldn’t hike the way I used to and it took some adjusting to except what I could and couldn’t do. We still managed to do quite a bit. When we took time off the bikes to housesit in Maine I was determined to get stronger and lighter. I joined the local YMCA and hit the gym 4-6 days a week, lost 15 lbs, and have gotten much stronger since my motorcycle accident 4 years ago. One of my goals was to be able to jog a couple of miles several times a week. I did it! Super exciting, especially since my doctor told me that I may very well never run again. Prior to reaching this goal I read “The Secret.” After reading that book and learning more about the Law of Attraction, I started trying to attract being strong, fit and healthy in my own way. I found myself chanting to myself “Strong. Fit. And Healthy – Strong. Fit. And Healthy…” over and over again when the going got tough during my workout, and I fully believe by attracting strong, fit and healthy, I was able to reach my goals. Going into our 2nd big adventure, I’m hoping that with all my hard work I will feel the benefits of being STRONG. FIT. AND HEALTHY. Correction, not hoping but knowing that I will feel the benefits of being STRONG. FIT. AND HEALTHY. Next PostWho is Steph to think she can do this?